The mobility app shows wheelchair paths, information about the accessibility of building entries, and the locations of shuttle bus stops. The author, a student at Kutztown University of Pennsylvania as well as a GIS development intern for the Pennsylvania Department of Transportation, developed an app to help fellow students who use wheelchair pathways more easily travel across the campus. For students with mobility issues, not knowing the best routes to class can cause delays that make them tardy. 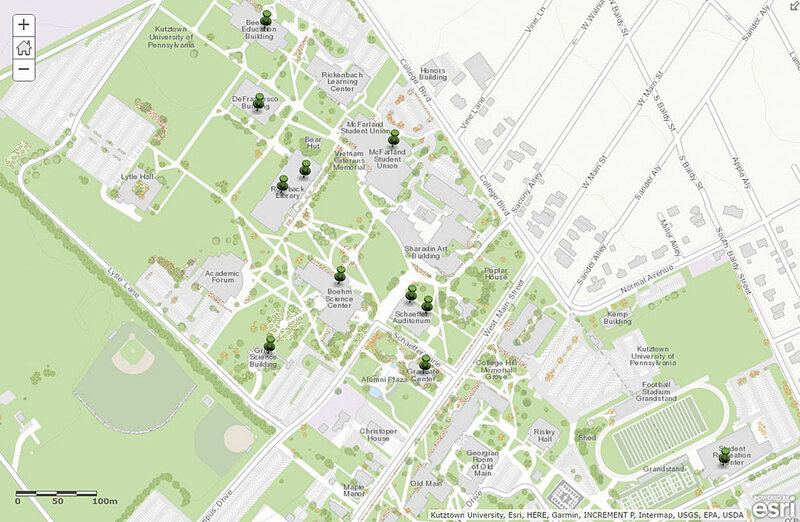 My previous work for the library at Kutztown University creating maps for campus event attendees with low vision led to my interest in improving campus accessibility. I had learned there are many ways to create navigation systems that help different student populations. This is a problem I felt could be tackled on a smaller scale, working with the college’s Disability Services Office. Using geospatial information to improve accessibility is often underutilized by colleges, but better accessibility is essential if educational institutions are going to accommodate the greater diversity of the modern student body. I created a web map app that provides new and easily updated navigational information for students with mobility challenges. The app’s development was triggered by a complaint that had been published in the student newspaper. This project was unfunded, and the work was done on a volunteer basis. It started in October 2016 and was completed by February 2017. I worked with the Disability Services Office’s director on Americans with Disabilities (ADA) compliance. Signs with a QR code that could be scanned by students to quickly open the app were located at prominent locations with Internet access. My solution had three major components: a basemap, a web app, and a QR code. ADA-compliant pathways were obtained from the university. The app uses the ArcGIS Online World Streetmap basemap. 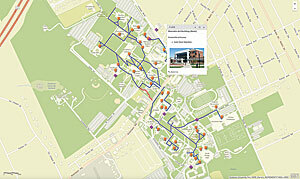 This basemap was enhanced with wheelchair-accessible walkways highlighted by blue lines. Students with mobility issues can use blue-highlighted pathways to find routes that are the most convenient for their class schedules. Points designating entryways provide further information. As I conducted my research for the app, I discovered that the accessibility of building entryways hadn’t been evaluated and the university’s standard accessibility map failed to identify details such as entryways in high foot traffic areas or whether entryways were close to elevators. For the initial application, I completed all evaluations of entryways. However, to keep up with campus renovations, I take volunteer information submissions and incorporate that information. Once the enhanced basemap had been completed and hosted on ArcGIS Online, I developed a separate web map app for presenting wheelchair pathways using Web AppBuilder for ArcGIS. I chose Web AppBuilder for its convenience and intuitive widget customization. Initially it was created for iOS, but an Android version was generated later. It took approximately four months to complete, mainly because I had to ensure that all ADA guidelines were met. A QR code was created that could be scanned by students to quickly open the app. For this project’s first wave of implementation, QR code signs were located at prominent locations with Internet access and were placed at the signage height recommended by the Americans with Disabilities Act Standards for Accessible Design. As with any product, keeping the lines of communication open between the consumer and those responsible for its maintenance is crucial. I maintain the app. The Disability Services Office provides pamphlets that contain my email so students can contact me. I also talk to student groups on campus that promote accessibility awareness. The response to the app has been positive. Students see it as a more convenient method of finding wheelchair pathways. The number of students using wheelchair pathways at Kutztown is not large, so the average number of users per month is about 10–20 students, though this total can increase depending on events that attract visitors to the campus. Although I currently update the app twice a year (fall and spring), I make small changes on a continuing basis. 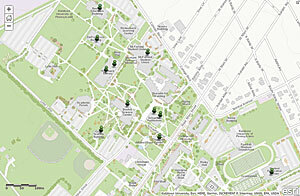 These changes are based on information about campus renovations and suggestions from users of the app. This new and relatively simple application for Kutztown University’s Disability Services continually evolves. I encourage other colleges to consider implementing a similar app to better assist students who have mobility issues and raise awareness of student diversity. 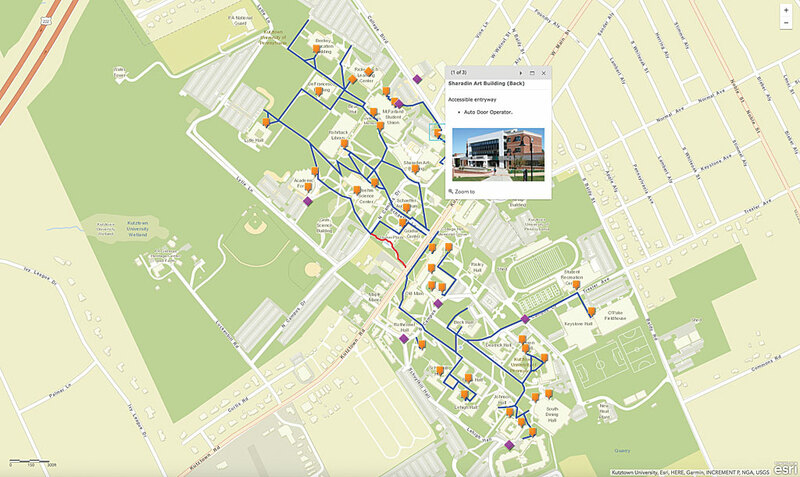 Implementing GIS for mapping event routes could also be very useful for reducing travel time for those who need to more carefully plan how to reach destinations on campus. For more information, contact Olivia Harne at oharn360@live.kutztown.edu. Olivia Harne is a GIS development intern for the Pennsylvania Department of Transportation (PennDOT). Currently, she is a student at Kutztown University, majoring in library science with minors in geography and computer science. She does freelance GIS work for Kutztown University, making accessible navigation tools for students.